01 September 2010 - (Darfur) – The Rwandan government announced on Tuesday that it is threatening to withdraw its peacekeeping troops in Darfur and southern Sudan. The move follows UN accusations that the Rwandan forces were involved in the inter-ethnic killing in the Democratic Republic of Congo in the 1990s. A diplomatic source told SRS on Wednesday that the withdrawal of Rwandan troops, one of the top contributing countries to the UNAMID force, will make UNAMID’s mandate quite difficult in Darfur. However, the governor of southern Darfur, Doctor Abdulhamid Musa Kasha, said that Sudanese forces are controlling the security situation in Darfur. He said there was no need for UNAMID peacekeeping troops in the region. Kasha spoke to SRS from Nyala on Wednesday. Rwanda has 3,556 personnel serving in UNAMID and UNMIS, the UN mission in Sudan. KIGALI, Rwanda - Rwanda says it is ready to withdraw its U.N. peacekeepers from Sudan if the U.N. publishes a report accusing Rwanda's army of possible genocide in the 1990s. Rwanda Defence Force spokesman Lt. Col. Jill Rutaremara said Tuesday that the country has finalized a contingency withdrawal plan from Darfur and Southern Sudan if the U.N. publishes its "outrageous and damaging report." A draft of the report leaked last week accuses Rwandan troops and allies tied to Congo's current president of slaughtering tens of thousands of Hutus in Congo. The alleged attacks came two years after those troops stopped Rwanda's 1994 genocide that killed more than 500,000 Tutsis and moderate Hutus. Rwanda has described the report as "fatally flawed." 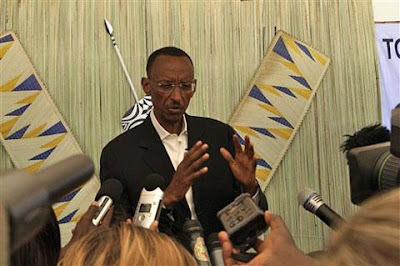 Photo: Rwandan president Paul Kagame holds a press conference in Kigali, Rwanda, as citizens vote for president Monday for the second time since the country's 1994 genocide, 9 Aug 2010. (AP). "... the justice minister said the government has reassured Amnesty it will be taking into consideration its concerns when reviewing the laws to improve them. “What Amnesty International has not told the world, which is really very unfortunate, is that I gave them three assignments to do for us. One [was] to check for us how this legislation is written in other European countries where hate legislation is in place. They have not responded to that. Then, I ask them also to do research for us on how our courts have interpreted it. They have not done that,” he said. Officials of Amnesty International were not immediately available for comment despite repeated attempts."